Life In A House of Blue ! : Pebble.com - Make shopping simple ! Home > Review > Pebble.com - Make shopping simple ! Pebble.com - Make shopping simple ! Recently I was introduced to a website called pebble.com. Pebble.com is a comparative online shopping website that also includes a forum to ask specific questions for you to get the answers you need. Simply ask your question and other shoppers will give you their opinion. 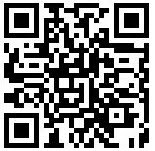 You can find any products you could want from a variety of categories: clothing, jewelry, sporting goods, electronics and many more. My oldest son who will be 14 in a few weeks wants a 8 GB Apple iPod Nano which is one of the most popular music players that lets you enjoy TV shows, movies, video podcasts, and more for his birthday. So before I started shopping online I thought I would give pebble.com a try. I typed in what I was looking far and there it was all in one place , product info, stores that sold it online & prices !!! Talk about a time saver ! 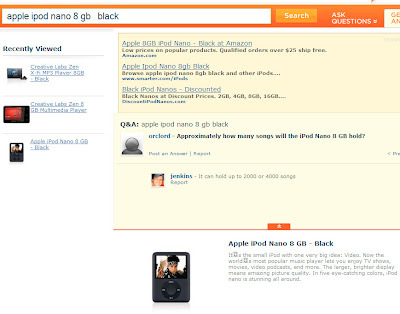 Seven stores and prices came up for the 8 GB Apple iPod Nano ranging from $140.55 to $369.99. 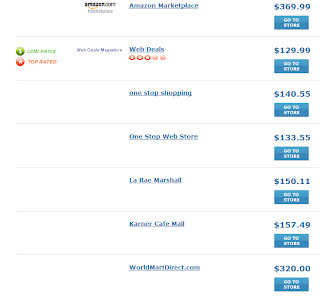 A couple of the stores that had it were WebDeals & One Stop Web Store. It is really nice that if I have a question about the product I can ask with just a click of the button, for the 8 GB Apple iPod Nano someone already asked a question I had about how many songs it holds. It was nice the Q&A were on the product page and easily seen. "Pebble.com is a new kind of comparative shopping website. Not only do we tout some of the best products from the world's leading merchants, but we enhance that experience by providing a forum for users to ask and answer questions about those products - making it easier than ever to find exactly what you're looking for. When you buy a product in a store, you can ask the salesperson for more details about certain features or attributes that are important to you. Online, it's nearly impossible to find that personalized service. Many website product descriptions fall short in some areas - they don't mention a feature you're looking for; they forget to list dimensions; they leave off information about compatibility. That's where Pebble.com comes in. We offer a place for users to pose those questions to other shoppers, who can then provide answers based on their first-hand knowledge of the products." Interesting, I'll have to check it out.